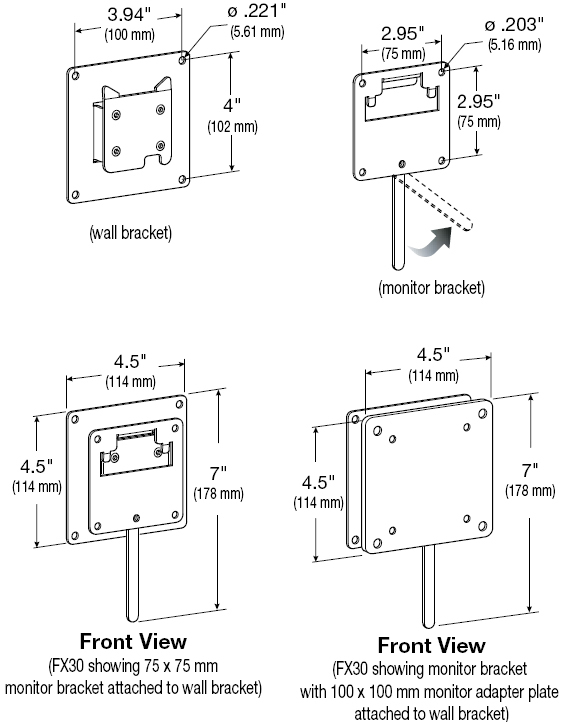 Ergotron 60-239-007 is a mount for TVs and monitors weighing up to 30 lbs and up to 37" in screen size. This dependable mount holds the display less than one inch from the wall, making it perfect in corridors, hallways, retail stores and even homes. Easy installation and removal adds to the attraction of this mount. The FX30 provides a solid and stable mounting solution for displays weighing up to 30 lbs. Its very low profile keeps the screen very close to the wall. Compatible with most small- and mid-sized LCDs. Holds monitors less than one inch (two cm) from wall. Solid and stable platform for touch-screen monitor compatibility. A quick-release lever facilitates easy attachment and removal.